This article should help developers to get started with Telerik UI for Xamarin suite and Visual Studio for Mac on Mac OS. Use our Project Wizard to create a project that has everything setup for you. You can start using our components right away without manually adding required assemblies and modifying solution files. If you choose this option, you can skip the next steps in this article and jump directly to the Getting Started section of any control. Create a blank Xamarin.Forms app and manually setup all requirements. If your scenario requires using this approach, please proceed following the steps in this article. Make sure that your Xamarin.Forms packages are up to date. You can either use the Visual Studio UI to update all packages to the required versions, or you can do it manually by editing the packages.config file in each project. 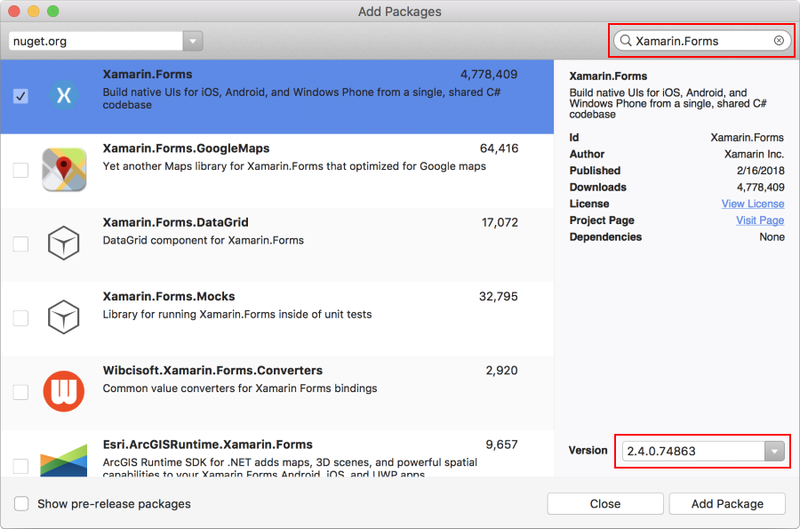 You have to make sure that you have the right version of Xamarin and all related packages. If your application requires specific version of a package, you can right-click directly on the packages folder and choose "Add packages...". This will work even if newer version of the package is already added. Each project in your solution contains packages.config file that contains all referenced NuGet packages. Users can manually update those files to include new packages or modify existing ones. After updating the respective files the NuGet Package manager will be able to restore the missing packs and update the existing ones. 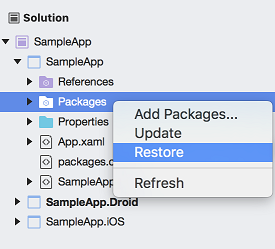 For the iOS and the Portable projects users need to update only the version of the required Xamarin.Forms package, this is the only required package. Its latest official version can be seen on the official NuGet page. 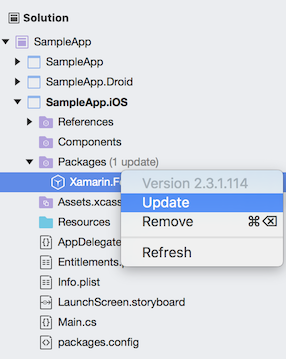 Open the packages.config file directly in Xamarin Studio and replace only the existing version with the latest one. 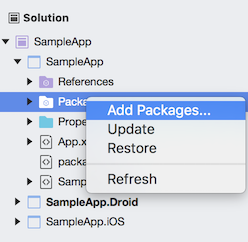 After updating the Xamarin.Forms package, you can go to Required Android Support Libraries article and check if you have all required packages and versions. Please bear in mind that the [TargetFramework] parameter in the packages.config file should be the same among all packages since they all target the Android platform. The value of this parameter can be seen from already installed packages. After updating all the packages.config files users are now ready to restore the packages. This can be done by clicking the settings icon of the solution and choosing “Restore NuGet Packages”.